Alfajores Cheesecake. All photos by Jessica Halfin. Shavuot is one of the three major pilgrimage festivals on the Jewish calendar, and it is specifically timed for the wheat harvest. Yet, puzzlingly, it is commemorated by eating milk products instead of flour (read: wheat) or the fresh produce one might naturally associate with a spring farming bounty. While there are several reasons religious scholars and rabbis proffer for celebrating the holiday with milk products, my favorite stems from the Bible. Besides being a harvest-time holiday, Shavuot also coincides with when Jews are said to have received the Torah at Sinai—laws that contained the rules of kashrut previously unknown to the wandering Jews. Some scholars suggest that prior to receiving the tablets, Jews shied away from all milk products due to interpretations from pre-Torah law that forbade their consumption. But in this time of great enlightenment, the laws regarding proper dairy consumption were created, and so, according to scripture, that’s what Israelites ate as they waited for Moses to descend the mountain. Around the world, Jews to this day celebrate Shavuot over cheese blintzes; rich, creamy dairy casseroles; and noodle kugels. In Israel and several diaspora countries, cheesecake is the shining queen of the holiday. Israeli cheesecake is lighter than the classic New York variety. Cream cheese and heavy whipping cream are swapped out for gvina levana (a spreadable yogurt-like cheese) or sour cream, providing a fluffier texture. The result is a treat healthy enough to eat for a mid-morning brunch rather than an after-dinner dessert. One of the most popular Israeli cheesecakes is topped with shortbread crumbs. My contribution to Shavuot cheesecake-baking is a play on another popular sweet in Israel—the alfajor cookie. Alfajores, treats of Argentinean origin, are comprised of dulche de leche (deep-colored caramel) sandwiched between two shortbread cookies and rolled in desiccated coconut. 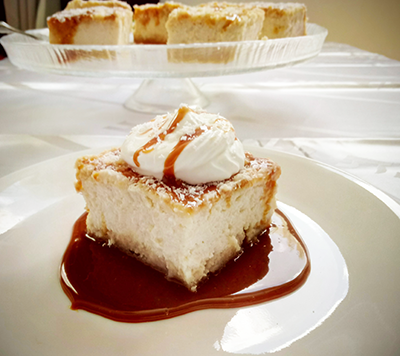 In pursuit of the ultimate Israeli-style cheesecake, I created a ricotta cheese and sour cream base with two layers of shortbread streusel that is topped with caramel sauce and coconut. Bake the cake in a casserole dish for practicality; I say this with complete sincerity—homemade cheesecake doesn’t have to be a big fancy production. Serve the cooled cake cut into squares with a dollop of freshly whipped cream and a caramel drizzle. From the land of milk and honey to your kitchen, wherever you may be, chag Shavuot sameach! Place a rimmed baking sheet or large roaster pan that is bigger than a 13 by 9-inch casserole dish on the middle rack of the oven and preheat to 350. Boil 3 to 4 cups of water in a kettle or the microwave to use as a water bath when baking the cheesecake. Set water aside for later use. In a medium bowl, combine the cold butter with flour, powdered sugar, baking soda and salt. Rub the mixture between your fingers to create a coarse crumble. Add vanilla extract and mix thoroughly. The mixture is ready to use when a small handful of the crumbs comes together as a dough when gently squeezed in one palm. Reserve 1 1/4 cups of the crumbs, placing them in the fridge to firm up while you bake the crust and prepare the cheesecake filling. Line the bottom of a 13 by 9-inch casserole dish with parchment paper, and press the remaining shortbread crumbs into the bottom to form a crust. Bake for 10-15 minutes until set and lightly golden. While crust is baking, prepare the cheesecake filling in a medium bowl: Combine cheeses, eggs, sugar, vanilla extract and lemon zest. In another medium bowl, combine flour, vanilla pudding mix and salt. Add about 1/3 of the cheese mixture to the flour mixture, and stir to combine. Combine the rest of the two mixtures and pour over the baked crust. Place cheesecake on the preheated rimmed baking sheet or roasting dish in the oven, then pour the hot water into the larger rimmed tray to surround the cake with a hot water bath (this is called a bain marie; the water should reach 1/3 the way up the casserole dish). Bake cheesecake for 20 minutes before carefully—and quickly—distributing the reserved shortbread crumbs on top. Then continue to bake for 20-22 minutes. The cheesecake is ready when the center is just set, but still jiggly. Once done, carefully remove cheesecake from the water bath and let cool to room temperature before transferring to the fridge to chill for at least 4 hours. 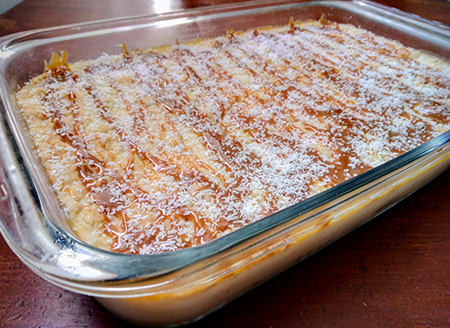 Once chilled, drizzle cheesecake with caramel sauce and top with desiccated coconut. To whip cream: Beat heavy cream and powdered sugar together until medium peaks form. Take care not to over beat, as you want a whipped cream that is soft enough to be dolloped on top of the cheesecake slices. Enjoy! What is hte function of hte vanilla pudding mix? Could it be left out or replaced with vanilla extract? Thanks for your comment! The vanilla pudding adds a bit of extra structure to the cake, as well as flavor. If it turns you off, you can try substituting the amount of the pudding mix with flour, to see what kind of result you get. It should work just fine, but could make for a slightly denser consistency.